Astronomers now know that the Saturnian system has not one, but two "Pac-Man" moons — and there could be many, many more. 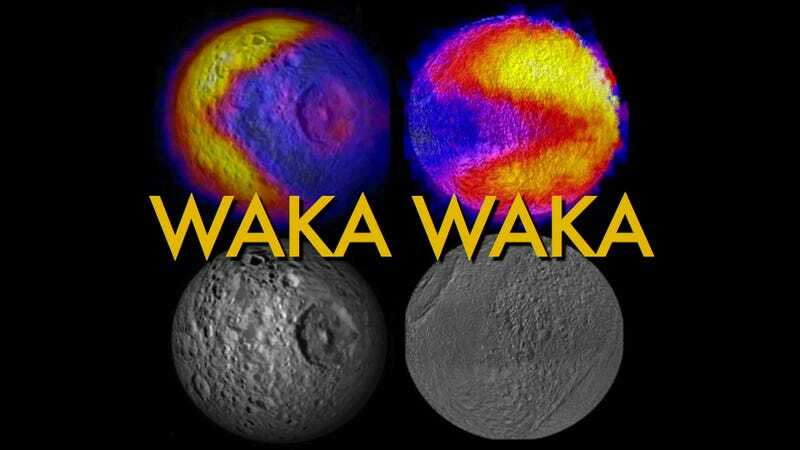 Back in 2010, infrared heat maps of Mimas (also known as Saturn's "Death Star" moon, for reasons that should be fully armed, operational and obvious), gathered by NASA's Cassini spacecraft, revealed a Pac-Man shaped heat signature on its surface (pictured up top and below, on the left). Now, Cassini has returned evidence that Saturn's icy moon Tethys is covered in a similar pattern. Scientists theorize that the Pac-Man thermal shape on the Saturnian moons occurs because of the way high-energy electrons bombard low latitudes on the side of the moon that faces forward as it orbits around Saturn. The bombardment turns that part of the fluffy surface into hard-packed ice. As a result, the altered surface does not heat as rapidly in the sunshine or cool down as quickly at night as the rest of the surface, similar to how a boardwalk at the beach feels cooler during the day but warmer at night than the nearby sand. Finding another Pac-Man on Tethys confirms that high-energy electrons can dramatically alter the surface of an icy moon. It also suggests that moons with this heat signature may be more common than we realized. "Finding a second Pac-Man in the Saturn system tells us that the processes creating these Pac-Men are more widespread than previously thought," said Carly Howett, the lead author of the paper describing the so-called "thermal anomaly," published in the latest issue of the journal Icarus. "The Saturn system - and even the Jupiter system - could turn out to be a veritable arcade of these characters."